There has been confusion concerning the differences between communism and socialism. For example, we heard television talking heads once declare that the late Hugo Chavez, the dynamic leader of Venezuela, was a communist. He was really a socialist and instrumental in leading a large block of neighboring South American countries into a collective socialist state. From our perspective, that appeared to be a good political move for Chavez and his friends, and the people seemed to like it. The Bush Administration, on the other hand, declared Chavez as an enemy and might even have considered going to war against Venezuela if the military wasn’t already so involved in improper actions in the Middle East. We believe much of the confusion lies in the fact that there are similarities between the two political ideologies. Even Karl Marx believed that socialism was a stage on the way to communism. Because of what he taught, many of the people who got interested in communism at beginning of the Twentieth Century were calling themselves socialists. And while Russia was under the harsh communist dictatorship of Joseph Stalin, the nation was known to the world as the Soviet Socialist Republic. It is important to understand that Marx did not invent communism or socialism. Both ideologies existed and were tried among communities and some countries before Marx. But Marx, who published his Communist Manifesto in 1848, became the single most-respected authority concerning the world movement toward communism in his day. Marx, a brilliant philosopher, political economist and revolutionary, believed that capitalism would eventually be replaced by socialism, which in turn would develop into communism. In his day, before the concept of communism was misused, Marx perceived this as a very good thing. A lot of people who read his book agreed with him. The general definition of communism is a social system in which all property is owned by the community. Under socialism, the collective ownership of management of only the material agencies of production becomes property of the whole community. Thus Chavez, whose government has seized the nation's oil wells and production facilities, but not the property of the people, was a socialist. Under Stalin-ism and under Maoism, the people of both Russia and China literally became the property of the state. Their homes, their jobs, and everything they were allowed to have and do, were decided by the state. It was easy to see that this was an extremely radical concept and one that people in the West could not accept. The concept of communism was to make everything the property of the whole community. But under Stalin and Mao, and Cuba under the rule of Fidel Castro, the community appeared to lose its voice under the force of dictatorial rule. Thus communism was perceived by the western world as an evil and "godless" form of government that must be stopped in its tracks. The United States got involved in two major wars, in Korea and Vietnam, in its attempt to do just this. These nations were called godless because both the Soviet Union and China were ruled by atheist regimes that insisted that religious institutions remain subordinate to the state. In China, all houses of worship were converted into non-religious buildings for secular use and religious worship was discouraged. This rigid rule has been relaxed in recent years and people are beginning to return to open religious worship. In fact, the 1978 Constitution of the People's Republic of China guarantees "freedom of religion" although there remain a number of restrictions. Marx and Friedrich Engels, another author living at about the same time, collaborated in numerous publications promoting the concept of socialism and communism as a relief for the struggling working class of their day. Their vision for the future, however, was not the kind of politics that erupted following the Russian revolution that toppled the Tsar. Marx perceived everyone turning to a socialist state, where all people shared in the fruits of their labor. Then as they evolved through improved education and spiritual enlightenment, he believed the central government would disappear as economic cooperation improved. Marx, who actually believed the human could evolve and share this kind of utopian existence, taught that the principles of distribution were "from each according to his or her ability, to each according to his or her need." The whole idea was to come up with a political and economic system where all people were guaranteed equality and that all wealth was evenly shared. They saw that capitalism, which grew out of the old feudalistic concept, was driven by the need to constantly increase profits which created a "dog-eat-dog" mentality. As it has turned out, these brilliant thinkers were right. 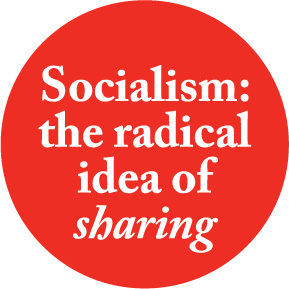 A socialist system may still be a good solution for the great problems of the world, but the stigma attached to the name, because of what happened under Stalin and Mao, may prevent this from ever happening. Capitalism is and always has been incapable of protecting or sustaining the Earth's ecology, which is now in great peril. Since the Western nations still insist on clinging to capitalism and the wealthy “kings” are back on their thrones of power, understanding the differences between communism and socialism may be mote.